Youth Policy Options Day – BC 2018 Budget Submission – Opioid Action Plan – and more! 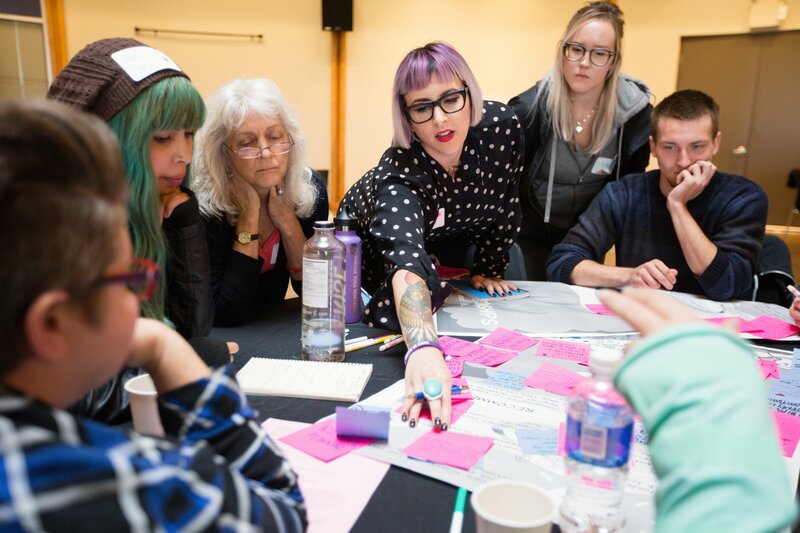 On September 30, First Call attended the Youth Policy Solutions Day strategy meeting held by the Vancouver Foundation’s Fostering Change initiative at Musqueam Cultural Centre, as youth in and from foster care gathered to discuss child welfare policies and highlight priorities for change. Based on that, First Call’s Dylan Cohen and McGill School of Social Work PhD Candidate Melanie Doucet, working with the Fostering Change Youth Advisory Circle, prepared a policy brief presented to more than two dozen MLAs at a lunch event on October 24 at which former youth in care shared policy recommendations. 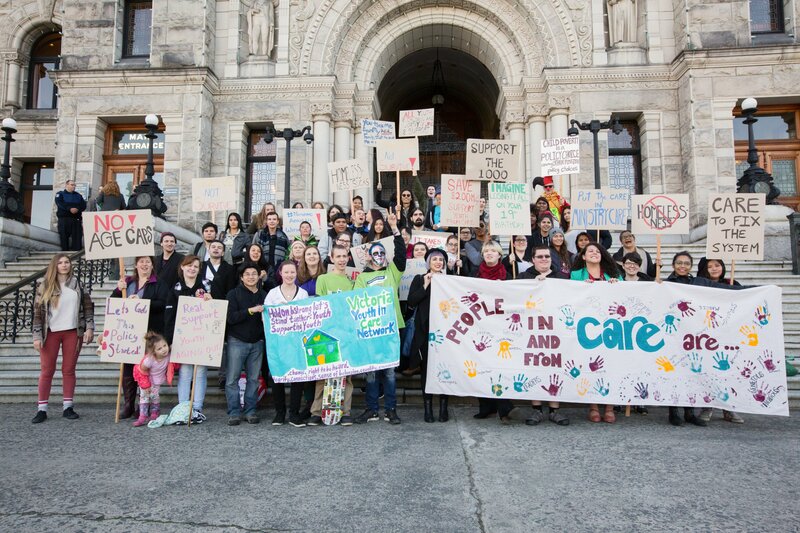 Later that day, our rally on the steps of the BC Legislature drew a crowd of 200 supporters who heard youth with experience in foster care speak about how they want policy to change in the areas of housing, post-majority support and education, among other issues. Rally attendees included Premier John Horgan and supportive remarks were shared by BC’s Representative for Children and Youth Bernard Richard and Minister of Children and Family Development Katrine Conroy. Watch videos from the October 24 Youth Policy Solutions Day. First Call has submitted a written brief, Respecting Child & Youth Rights with Timely Investments, to the Select Standing Committee on Finance and Government Services as part of their public consultation to prepare British Columbia’s 2018 budget. Adrienne also made an oral submission on October 4 to the Committee, highlighting First Call’s funding priorities for the 2018 Budget. Recommendations made in the submission address early childhood Investments, measures First Call wants built into the upcoming provincial poverty reduction plan, ways to strengthen and improve BC’s child welfare system, and where funding should be prioritized at the K-12 and post-secondary level. First Call’s Early Childhood Development Roundtable also sent a letter to Minister of Children and Family Development Katrine Conroy and BC Green Party Leader Andrew Weaver to call for urgent action on their shared commitment to a strong universal child care system for BC families in the next provincial budget. Read the ECD Roundtable child care letter. At the October 11 First Call coalition meeting we agreed to sign an open letter drafted by the Public Health Association of BC which calls on the BC government to develop and implement a BC Opioid Action Plan. The letter proposes the plan be based on the four pillars of the new Canadian Drug and Substances Strategy—prevention, harm reduction, opioid addiction treatment and enforcement. On September 30, Adrienne, Dylan and John joined the Fostering Change initiative’s Youth Policy Solutions Day strategy meeting, at which Adrienne and Dylan led a workshop on policy advocacy and to brainstorm priorities for future work in those areas. On October 1 and 9, Dylan met respectively with the Youth Advisory Committees at Aunt Leah’s Place and Vancouver Aboriginal Child and Family Services Society, inviting them and other youth in and from foster care to join First Call’s October 24 Youth Policy Solutions Day. On October 14 Adrienne spoke about First Call’s poverty advocacy work to Community Action Network participants at the Downtown Eastside Neighbourhood House. She also made presentations on child and family poverty to the Langley Business and Professional Women’s Council and to members of the BC Association of Social Workers. Adrienne, Dylan and John were excited to accompany youth to Victoria for the October 24th Youth Policy Solutions Day described above.